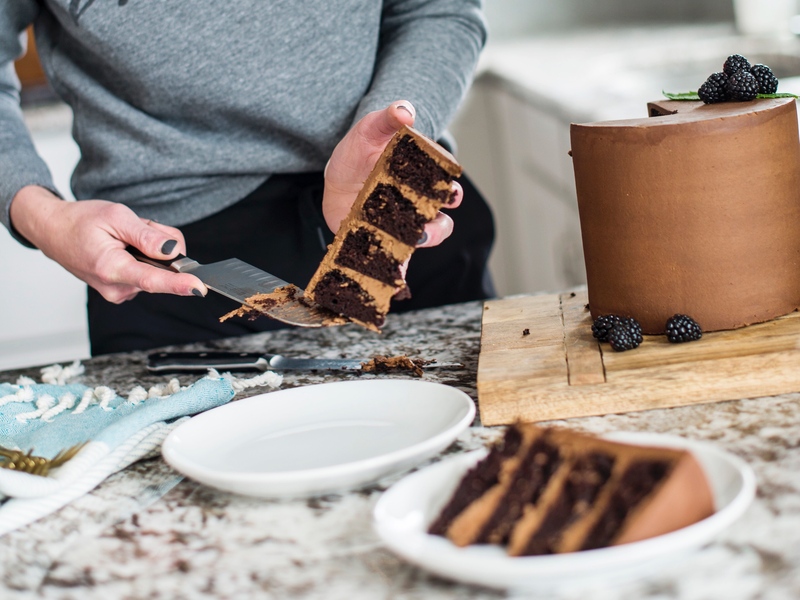 My new egg-free and dairy-free chocolate cake with chocolate frosting is as decadent and delicious as the real deal. 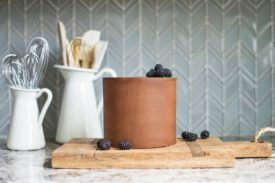 It’s time for one more allergy friendly cake! 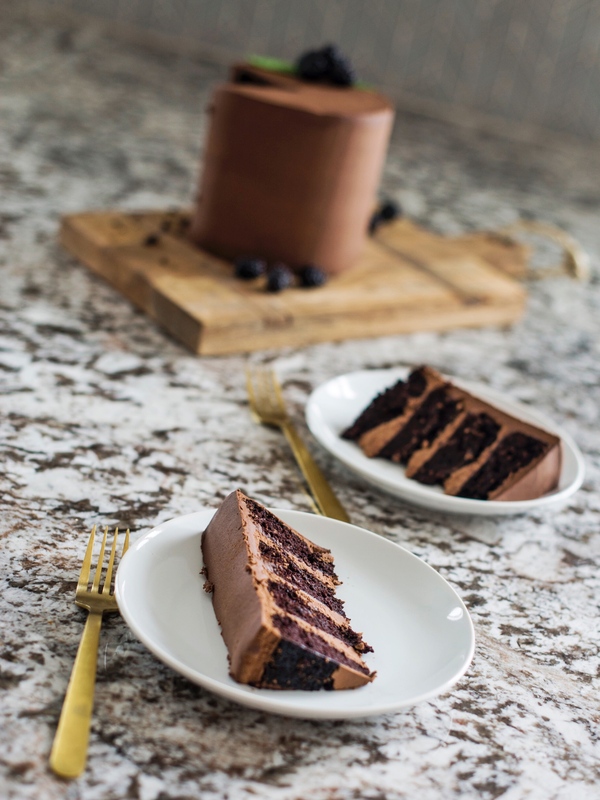 My new Egg-Free and Dairy-Free Chocolate Cake with Chocolate Frosting is just as rich and decadent as my regular chocolate cake and chocolate frosting. Had I not told you it doesn’t include any egg or dairy products, I don’t think you’d ever be able to tell. At least my kids couldn’t! 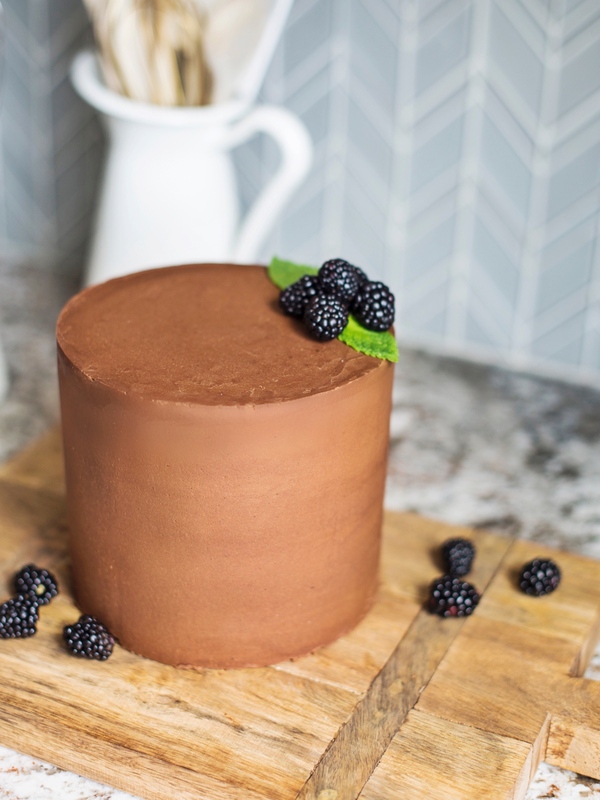 For the base of this cake, I used my go-to chocolate cake recipe. 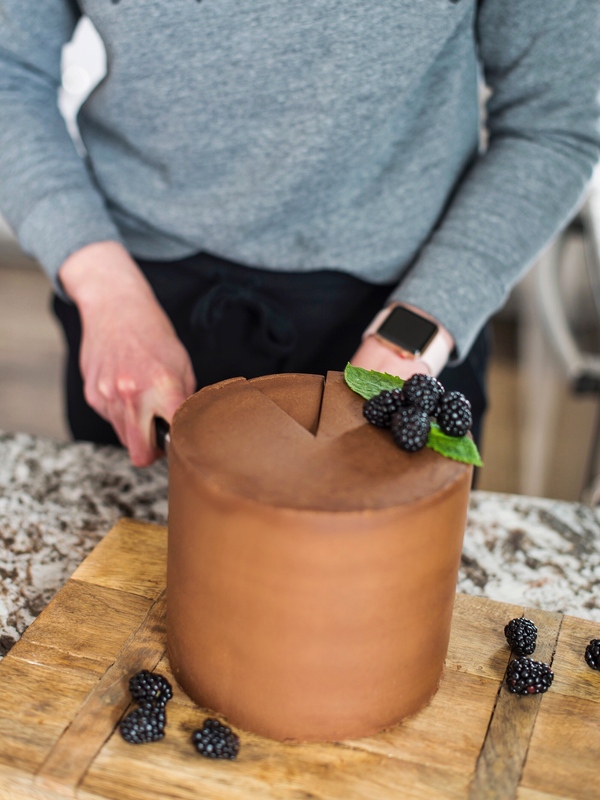 I subbed canned coconut milk for the buttermilk, excluded the eggs and added white distilled vinegar – which, if you read my full post from my egg-free and dairy-free vanilla cake, you’ll know was the key to success in these cakes. The cake turned out just as moist and rich as my regular chocolate cake. For the frosting, I did the same combination of vegan butter and hi-ratio shortening as I did for my dairy free vanilla frosting. I also added some melted dark chocolate and a little cocoa powder with the powdered sugar. It’s a creamy, silky frosting but does tend to harden as it sits. If you find this to be the case, just add a little canned coconut milk and re-beat the frosting. I noticed that the frosting worked best when applied to the cake right away – while it was still creamy. Like most of my cakes, this one can be made in three 8-inch pans or four 6-inch pans. The baking time will stay the same for both size pans. I also tested the chocolate frosting with my vanilla cake and the chocolate cake with vanilla frosting. Both combinations were total winners! I can’t wait to hear what you think of both of my egg-free and dairy-free cakes and frosting. I hope they meet your expectations and wow your crowds! 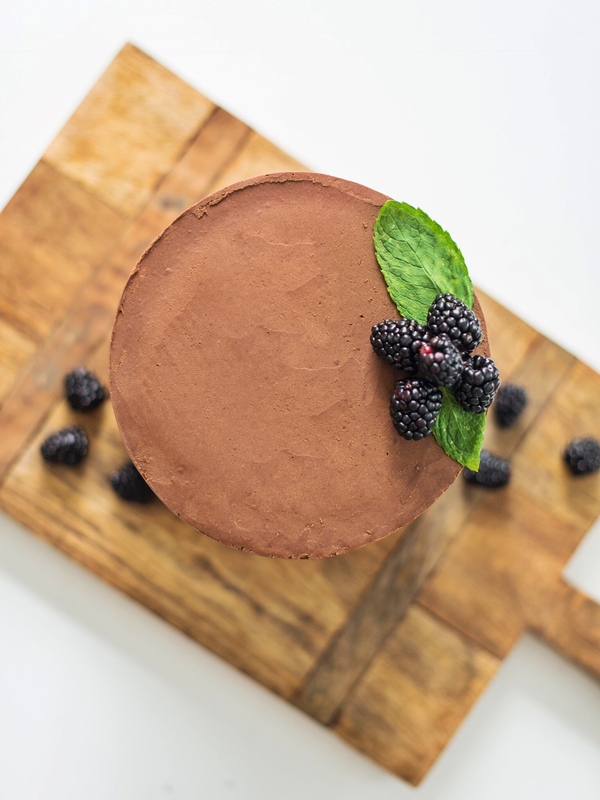 A decadent chocolate cake and creamy chocolate frosting, made without egg or dairy products. Preheat your oven to 350 degrees. Spray each pan with non-stick baking spray, line the bottoms with parchment paper and spray again. Set aside. In a medium-sized bowl, combine the coconut milk, water, oil, vinegar and vanilla. Set aside. In the bowl of a stand mixer fitted with the paddle attachment, combine all the dry ingredients. Stir for about 10 seconds to mix the ingredients together. With the mixer on low speed, add the coconut milk mixture. Mix until just combined. Stop the mixer and scrape down the sides and bottom of the bowl. Mix again for about 10 seconds. Evenly distribute the batter between the four 6-inch pans or three 8-inch pans. Bake for 25 to 27 minutes, or until a toothpick inserted in the center of the cake comes out with just a few moist crumbs on it. Cool in the pans for 10 minutes before inverting onto wire racks to cool completely. 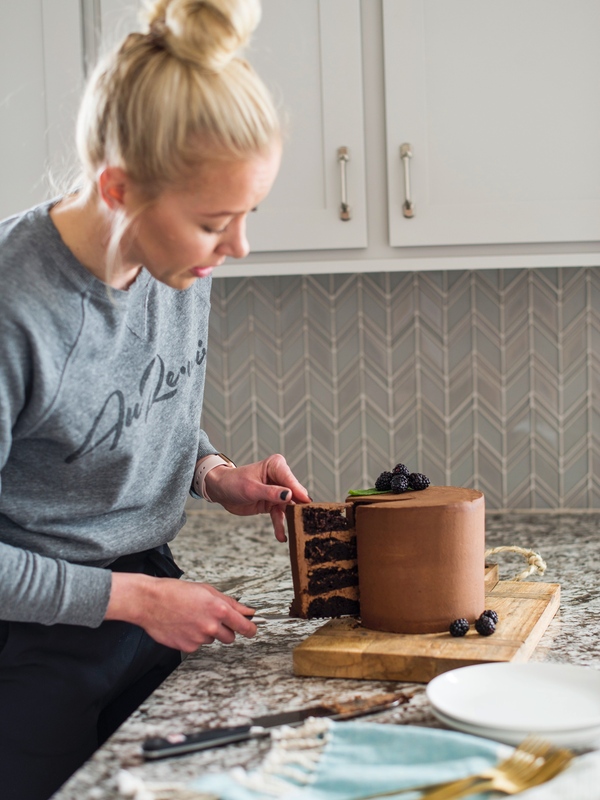 Once cooled completely, carefully wrap each layer in plastic wrap and freeze for at least an hour before you start to assemble the cake. Can be frozen in plastic wrap for up to a week. 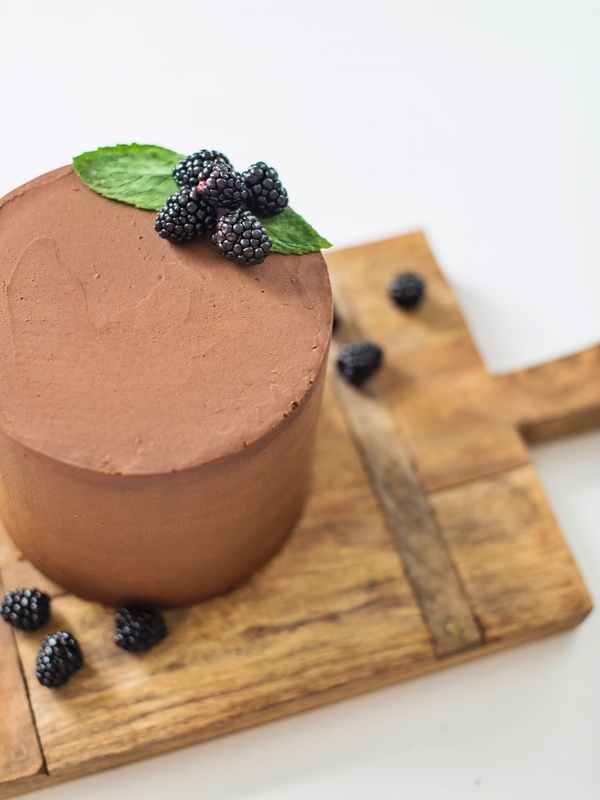 If you freeze the cake longer than a week, wrap in foil as well and place in a zip lock bag. Sift the powdered sugar and cocoa powder. Set aside. In the bowl of a stand mixer fitted with the paddle attachment, combine the butter and shortening. Beat on medium until well blended. With the mixer on low, gradually add the melted chocolate. Mixture will be thin. Turn the mixer off and scrape down the sides and bottom of the bowl. Mix again for about 10 seconds. Keep the mixer on low and gradually add the powdered sugar, followed by the salt and vanilla. Turn the mixer to medium and beat the frosting for a couple of minutes. The frosting should be creamy. If it's a little stiff, add a couple tablespoons of coconut milk. If you don't use the frosting right away, it will thicken as it sits. To get it back to a creamy and spreadable consistency, re-beat the frosting and add more coconut milk. Courtney this cake is fantastic! I have tried so many different recipes and failed. It’s so easy and delish. I used 9inch tins and made two layers and it still turned out good. This will definitely go into my recipe book. Thank you!! I had a question with respect to vinegar for egg substitution. I have read that one tbsp + baking soda is a substitute for 1 egg. In your recipe, you have substituted for three eggs. So how does that work? Hello! Just wondering how long the chocolate frosting could stay good in the fridge for?? THANKS!! If it’s covered well, I’d say about a week. First of all, let me tell you that I loved your vanilla cake and turned out perfect. This time I tried making the chocolate cake and it sank considerably in the middle, and looked very wet so had to leave the cake in the oven for an extra 12 minutes. So I wanted to make sure with you if the ratios of the ingredients are accurate. I noticed that the amount of flour and vinegar is a much lesser proportion than the vanilla cake. I also used hot coffee on the batter. I want to try and do it again tomorrow so I just wanted to double check with you if I need to change something in my process. Oh no. I’m sorry to hear that. Obviously it shouldn’t sink, but that happens when we over mix the batter or the baking powder or baking soda are old. You could also try removing about 1/4 cup sugar to help it rise better too. My pleasure! I’m so glad you liked it!! !